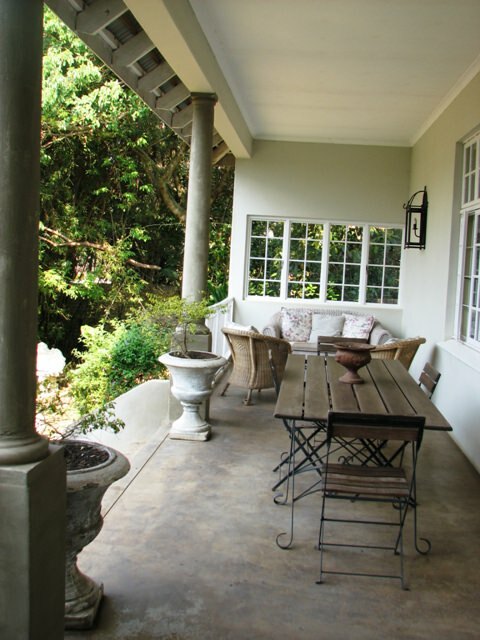 I’m on the verandah of the Lemon Tree Bed & Breakfast in Kloof, a posh suburb of Durban. A breeze is rustling the royal palms in the garden. It’s calm and quiet. The verandah at the Lemon Tree. We left home at 8:00 a.m. on the six-hour journey to Durban. Less than an hour outside Joburg, we heard a loud clunk from the LandRover, followed by a menacing rumble that persisted whenever Joe pressed the accelerator. We pulled to the side of the highway – we were in Mpumalanga province, far from anything, on a Sunday. Joe propped the hood open. A bolt had fallen out (it probably came loose during our off-roading adventure in Lesotho) and created a hole in the exhaust system. Joe determined that the engine would run well enough to get us to Durban. But it now roared like a monster truck. We made our way through Free State province, then over a high ridge and down into KwaZulu-Natal. The temperature rose as we dropped in elevation – from 1,700 meters to 600. Air conditioning was out of the question so we sweat it out. We arrived at the B&B at around 2:30. We dropped off our luggage and briefly admired the lovely surroundings before heading to town. Joe is covering the African National Congress (ANC) General Council meeting, which is in Durban this week. President Jacob Zuma will address the congress today. Joe had warned me about the legendary disorganization of these meetings but I didn’t truly understand what he meant until yesterday. Joe had been instructed to go to the conference center at 4:00 p.m. to collect his press credentials. We arrived at the conference center, and after 30 minutes of wandering around, learned that credentials were actually being given out at City Hall. We drove to City Hall, where we maneuvered through police barriers and cars parked every which way. Joe squeezed the monster truck between two other cars and instructed me to wait there and make sure no one parked us in. I held the traffic at bay – barely. Joe returned in 10 minutes. Press credentialing was delayed; the ANC had lost everyone’s information. It might start at 6:00, or maybe 8:00. Joe was fed up so we left. We drove to an area called North Beach. Vacationing families and surfers were packing up for the day. The sun was starting to go down; people strolled the cement promenade and live music played at a rooftop bar called Joe Cool’s. 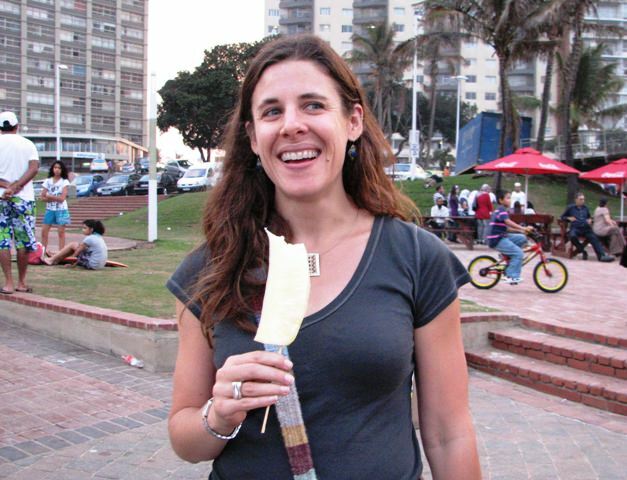 The crowd was diverse – black Africans, white Africans, Indian Africans. Kids in bathing suits trotted among women in head scarves and full abayas. We walked to the end of the pier and took in the scene. I bought pineapple on a stick from an Indian street vendor. I ate it plain as I was afraid to try the spicy version. Maybe tomorrow. We were ready to blow off the credentialing and return to Kloof for a quiet dinner. But Joe got a text from a colleague that credentialing had begun. Back to City Hall. Quick side note: Joe was really enjoying his monster truck. Each time we stopped at a traffic light, he glanced at the car next to him and revved the engine, then roared off with a mischievous grin when the light turned green. I had flashbacks to cruising the highway in Ocean City, Maryland, circa 1992 — with different scenery. 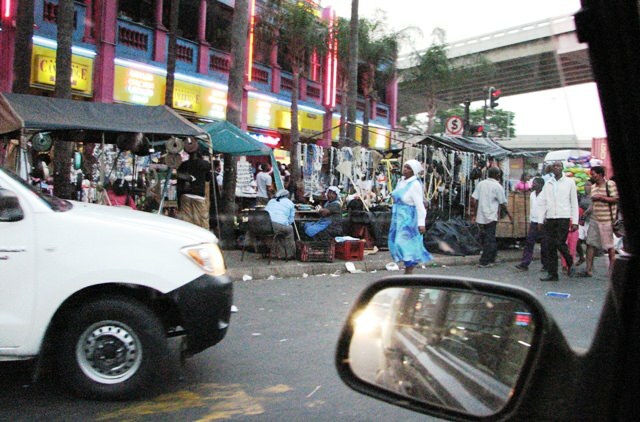 A typical street in Durban. This time I accompanied Joe into City Hall. 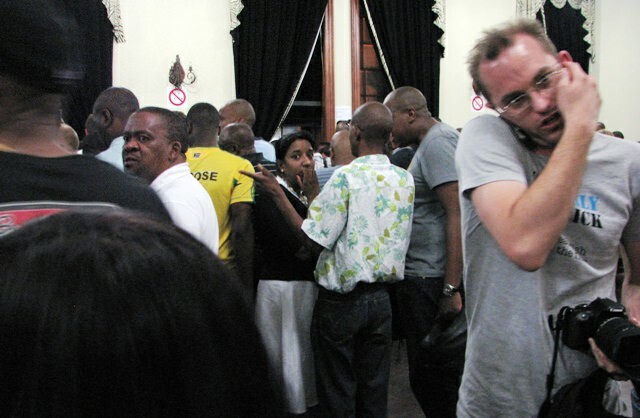 The registration room was filled with ANC delegates and hoards of angry journalists. There were lines, but no one knew what they were for or which one to wait in. People laughed, shouted, jostled, and yelled into cell phones. Joe managed to snap this photo before we were advised to put the camera away. It accurately conveys the mood at Durban City Hall last night. We learned that there was one line for journalists to add their names to a list, and another line to get photographed for an ID. Joe pushed his way through the name line and moved on to the photo line, which didn’t move for 45 minutes. By now it was nearly 8:00 p.m. and we were faint with hunger. We surrendered and left. 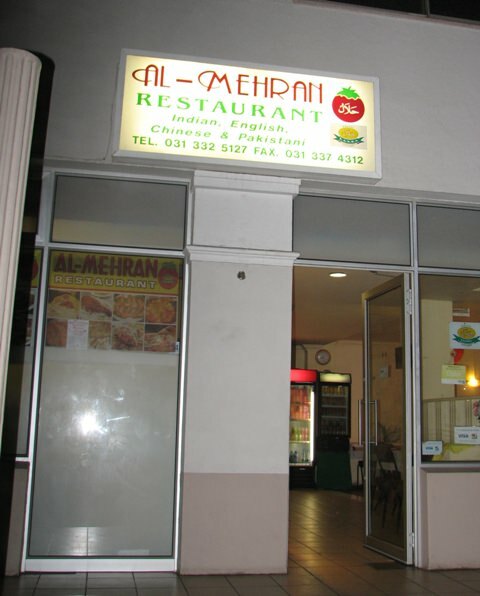 We went to Joe’s favorite Indian restaurant in Durban, Al-Mehran. I was eager to try a Durban bunny chow after my recent experience but decided to save that for later. 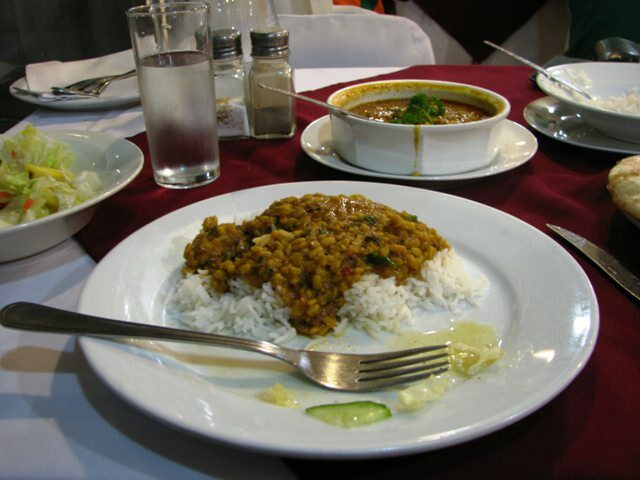 We had curried lentils, mutton, rice, and butter naan. It was delicious and our bill came to $14. We felt a renewed sense of vigor after eating and rumbled back to City Hall. The lines were longer than before. I settled myself in the back of the room and read boring conference literature amid a sea of jovial ANC delegates. Joe had his photo taken around 10:00 and was instructed to pick up his ID in the morning. We happily departed and returned to the Lemon Tree, where we sat on a bench outside our room and listened to the frogs. Joe left for the conference early today – hopefully he got his ID and found time to drop off the LandRover for repair. I was happy to stay behind and enjoy this peaceful oasis away from the monster truck and the ANC madness. 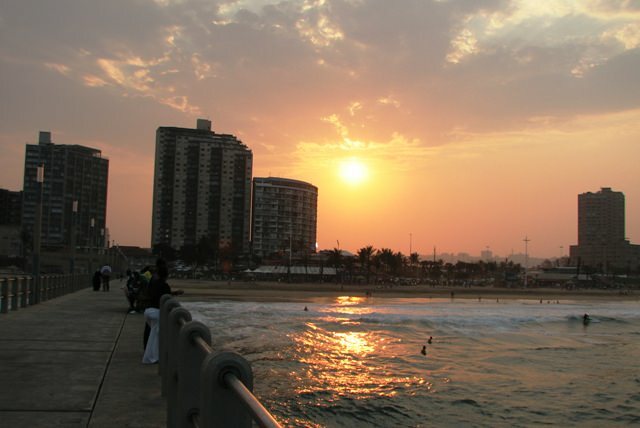 Stay tuned for more adventures from Durban.